Will Following Advice From a 1988 Book On Fads Make Me a Millionaire? What would you do with a million dollars? This was a common thought experiment growing up, a question posed to conjure up childish dreams of sports cars, private islands, and jet packs. In retrospect, it’s all completely ridiculous…or, at least it was completely ridiculous until I found the book that will change my life forever. 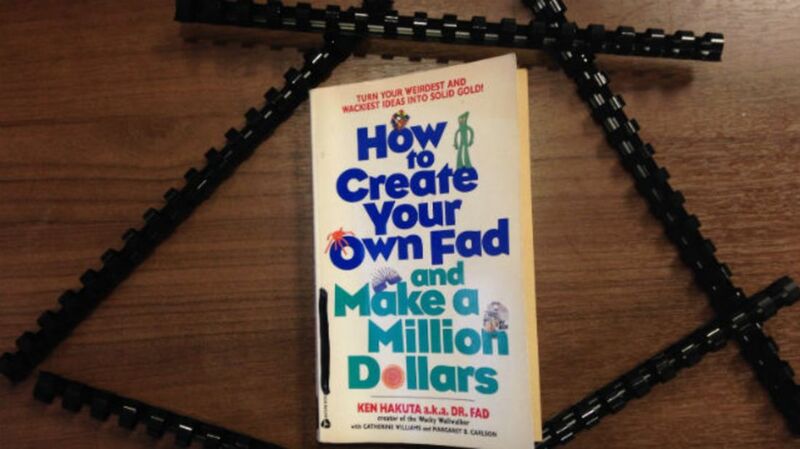 How to Create Your Own Fad and Make a Million Dollars was written in 1988 by Ken Hakuta (a.k.a. Dr. Fad) and it is no longer in print. I can’t prove it, but my theory is the Federal Reserve had the book banned because they feared it would create too many millionaires and the country would run out of money. Astonishingly, I was able to acquire How to Create Your Own Fad and Make a Million Dollars for only $4.95, meaning I can expect a 21000000 percent return on my investment (or, “ROI” as we call it in the biz). On my quest to make a million dollars, I aim to follow Hakuta’s book as closely as possible. Like a good fad, good advice is timeless. DR. FAD WILL GUIDE ME. The book’s cover calls Hakuta the “creator of the Wacky Wallwalker,” though that distinction is technically false. In the short biographical chapter that opens HTCYOFAMAMD (the easy-to-remember acronym that will be used for How to Create Your Own Fad and Make a Million Dollars from this point forth), Hakuta makes it clear that he didn’t come up with the toy himself. In 1982, Hakuta’s parents sent his children a care package from Tokyo that contained in its contents a little rubber eight-legged toy called a Taco (a take on "tako," Japanese for "octopus"). When thrown against a wall, the Taco would suction to it and then jankily walk down as if of its own volition. Already a relatively successful importer-exporter (he imported karate uniforms from Korea and exported Teflon ironing board covers to Japan), Hakuta knew the toy had potential. He contacted the manufacturer and offered to buy 300,000 Tacos for $120,000 and the worldwide rights to the toy. He re-branded the toy as a “Wacky Wallwalker,” and the rest is history. Thankfully, that cold, hard strategy fills the pages of Dr. Fad’s valuable book. “You are operating alone,” he writes, “like Willy Loman with his shoeshine and his smile, bucking the odds.” If Death of a Salesman teaches us anything, it’s that hard work always guarantees a happy ending. Watch out, Mr. Loman, there's a new business success story in town! WAIT, WHAT IS A FAD? Unfortunately, Dr. Fad's book doesn’t supply a list of lucrative, unclaimed fads that are free for the taking, so I am forced to come up with my own. He does, however, include some valuable rules as to what does and doesn't constitute a fad. The inherent pointlessness of a fad is what makes it so much fun. Years ago, the goofy and frivolous toys mentioned above scratched a certain consumer itch. However, in 2015, memes and other online jokes have filled that niche. Behind their silly facades, both toy fads and memes also provide serious cultural currency (“I get the Pet Rock, I’m in on the joke”...“I get doge, I’m in on the joke”). Dr. Fad, you genius. What would be more original in 2015 than a fad that exists outside the Internet? Sure, today’s biggest fads have at least some Internet component (e.g. selfie sticks that are used to take photos for online sharing; self-balancing electric scooters made popular by vaping Vine stars), but to break free from that mold, I must return to fad culture’s simple roots. Good to remember for the year 2061. “Whatever you do, don't sink your life's savings into cliché items. I walk into souvenir and gift shops all the time and feel sorry for the guy who thought up the item that consists of a 'stick in the mud.'" While this should be a simple two-step process (1. Create your own fad. 2. Make a million dollars), step one has proven itself to be much more difficult than I had imagined it would be. Inventing a fad is so hard, even Dr. Fad couldn’t do it. Following his lead, I searched for a Japanese toy I could buy the rights to and market in America. Knowing I’d have to purchase the toys in bulk, I went to Alibaba.com. Alibaba connects consumers with manufacturers and is the largest e-commerce company in the world, so if anyone has my Wacky Wallwalker, it's them. I figured my fad-making days were prematurely cooked—that is, until inspiration struck. And like all true Eureka moments, it came when I least expected it, when I was in Staples buying a reception-area-sized tub of Red Vines. There, amongst the hodgepodge inventory of office supplies, lived my million dollar idea. Like a bolt from Zeus it struck me: STUPID STRAWZ. To you, the above may look like standard binding combs for self-publishing documents. But to the refined eye of someone who has studied HTCYOFAMAMD, those inexpensive plastic strips are the world’s next great fad: STUPID STRAWZ. STUPID STRAWZ are like normal straws, except they don’t fit in most drinks and they don’t provide any suction. You know it, my man. STUPID STRAWZ has Wacky Wallwalker-level alliteration—that's a market-proven literary device. GETTING THE STUPID STRAWZ BRAND OUT THERE. Advertising is expensive, and Dr. Fad argues against using it in the early stages of your fad. “A single 30-second spot on Miami Vice will set you back $250,000,” he writes. Considering most fad-makers are delightful amateurs like myself, that kind of scratch is clearly out of the question. Instead, Dr. Fad advises, you should make the press do your ad work for you. “A news story has tremendous impact on buyers,” he says, and he should know. Hakuta focused on selling his toy to small shops near the Washington Post’s offices. On December 24, 1982, just two and a half months after Hakuta first laid eyes on that Japanese Taco toy, the Post’s style section featured a story on the Wacky Wallwalker. “Newspaper articles multiply like rabbits," he writes, and that story helped make the toy a bona fide super-fad. Soon after the Post story ran, Dr. Fad appeared on the CBS Evening News to talk about Wacky Wallwalker. “I’ll take a dozen,” Dan Rather said at the end of the segment, further boosting the toy's national profile. Thanks, you just saved me $250,000. THE LEGALITY OF STUPID STRAWZ. Seeing as my fad already has incredible press attention, I need to make sure all my ducks are in a row when it comes to matters of copyright, trademarks, and patents. A visit to the U.S. Patent and Trademark Office’s web site reveals that the name “STUPID STRAWZ” is not yet trademarked. According to the Wall Street Journal, online trademark registration costs between $275 and $325, which, I mean, come on. To get around this, I have left the registration form open on my browser, which means the STUPID STRAWZ trademark is pending. So back off. As for the legality of taking an existing product (like a Staples 1/2 inch binding comb), giving it a new name (and a great name: “STUPID STRAWZ”), and then reselling it at a higher cost? Here is where I may run into some problems. According to Justin Jacobson, a copyright lawyer at the Jacobson firm, that act would “constitute palming off and result in unfair competition claims.” So, for right now, all STUPID STRAWZ are not-for-sale prototypes. I need to find a manufacturer with whom I can work directly and who will make STUPID STRAWZ to my own unique specifications (i.e. 11/20 inch binding combs). In order to do this, I have to get my hands on some sweet sweet moolah. As much as I love my fad and am confident in its success, I don’t want STUPID STRAWZ to be the reason a plastic manufacturer's hired toughs break my legs. Without money there would be no STUPID STRAWZ. I needed help, and HTCYOFAMAMD provided me with one last option: 1-800-USA-FADS, the hotline set up by Dr. Fad to give advice to "budding fadsters" like myself. Calling that number today, however, connects you to an automated survey that promises a chance at winning a free Caribbean vacation. How could I turn down a tropical getaway? While I am on hold, stay away from STUPID STRAWZ. That trademark's pending.